Hawai'i Craftsmen, Honolulu Printmakers, and the Hawai'i Potters' Guild are among the local arts organizations swinging behind the Downtown Arts Center. The planned Center, located in Chinatown Gateway Plaza at Hotel and Nu'uanu, would be mixed use for galleries, studios, workshops, exhibitions, and office spaces related to the arts. 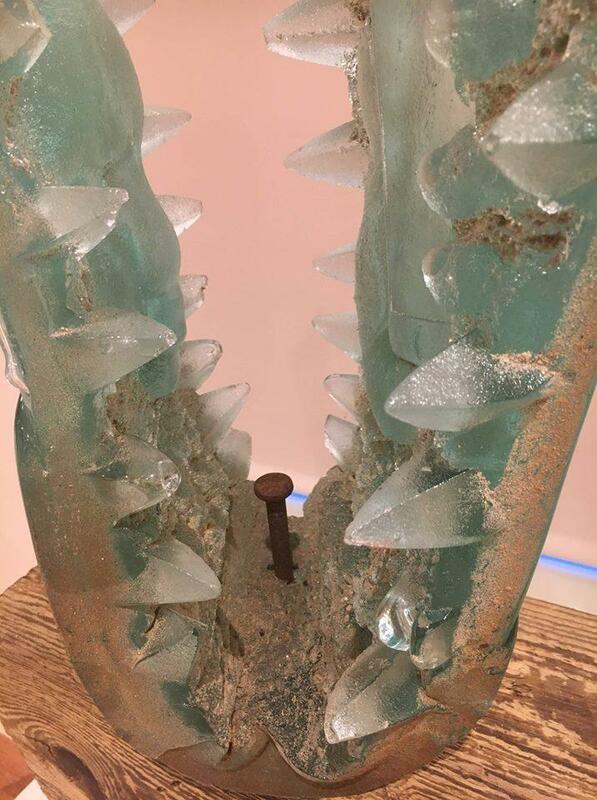 Sandy Pohl's Creative Arts Experience, headquartered in the Louis Pohl Gallery, is leading the effort. Sandy Pohl, gallery owner, arts administrator, community activist, proprietor of Louis Pohl Gallery on Bethel Street. 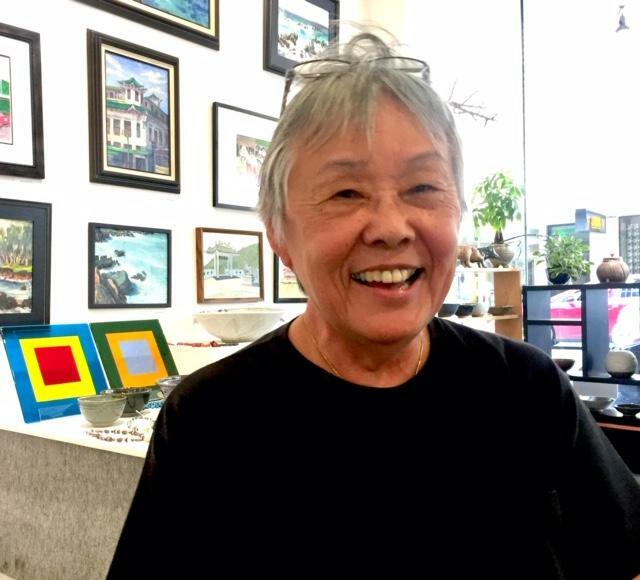 She secured a 2.5 month trial run in a 1400 sf first floor space, in the long vacant, City-owned Chinatown Gateway Plaza at the corner of Nu'uanu and Hotel Streets. The new Downtown Art Center: looking for artists and art organizations for galleries, exhibition space, shops, office space, and art related activities and events. The Conversation's Catherine Cruz talks with Noe Tanigawa about the Downtown Art Center test run. The Downtown Art Center Pop Up happens this Saturday, March 23 2019, from 11 to 4pm in the Chinatown Gateway Plaza at Nu‘uanu and Hotel Streets. The Center is directly across Tea at 1024. It's an open house for art lovers and future partners with printmaking demonstrations, plus an art show and sale. Fate may be smiling on the future Downtown Arts Center, because at this moment, the City of Honolulu is under scrutiny from federal officials for failing to provide the Chinatown enrichment promised when HUD funded part of the Chinatown Gateway Plaza. The City has until the end of this month, March 2019, to satisfy requirements or face an $8 million dollar plus repayment to HUD. Why might a Downtown Arts Center be a good idea? 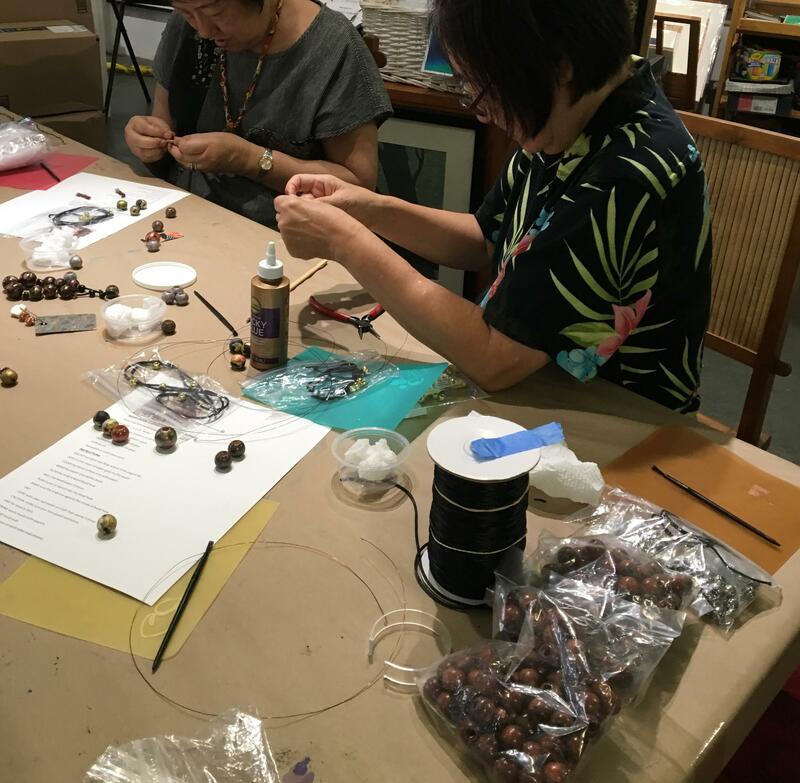 Carol Khewhok led the Honolulu Museum School then worked at Shangrila, and artist Sanit Khewhok was a conservator and collections manager with The Contemporary Museum. He also curated the Hawai‘i Pacific University Kāne‘ohe campus gallery for many years. Recently, in the HPR studios, they reflected on art centers they have encountered over the years. Carol Khewhok: The Bangkok Cultural Center. The place was hopping every day. They were doing street theatre—La Cage Aux Folles—on the street, they had chamber music groups, it was such a vibrant, exciting scene. Carol Khewhok: And the interesting thing was, there were as many international tourists visiting and enjoying the place as well as local people. We still have that problem in Honolulu, of never the twain shall meet between the groups, but why not? The PMQ complex in Hong Kong is another example. Former police dorms now house over 100 fashion, homeware, design, and other shops, plus restaurants. Jamming all the time. Could we do that? Possibly in the long vacant Chinatown Gateway Plaza at Nu‘uanu and Hotel? 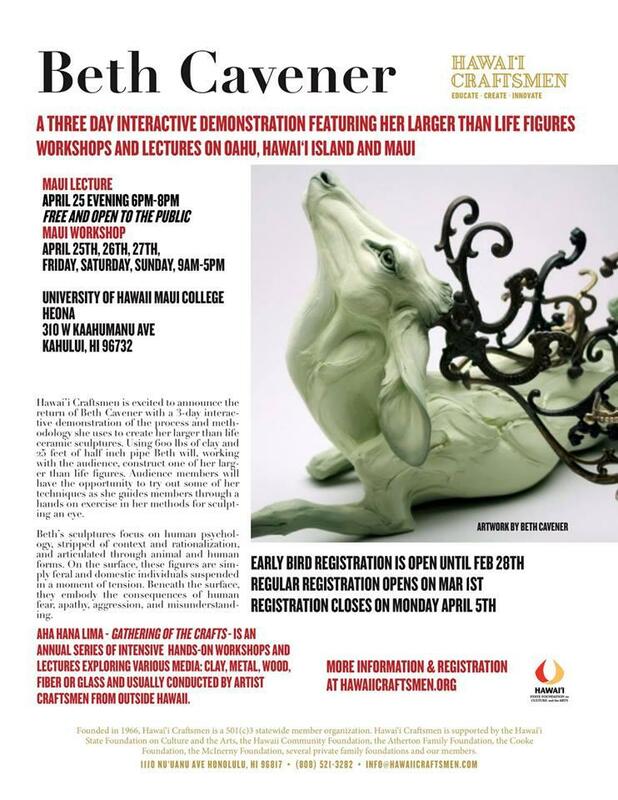 Hawaii Craftsmen, a powerful statewide organization, holds three large annual events, including Aha Hana Lima, an opportunity to exchange with offshore experts. Upcoming opportunities to hear from and work with artists like Beth Cavener are exactly what could take place in the Downtown Art Center, according to Hawaii Craftsmen President Mark Mitsuda. Harrison Rue, City Community Building and Transit Oriented Development Administrator, remembers the Chinatown Action Summit of a few years ago. Supporting the arts was a big part of the plan. He says artists are known to be 24/7 creatures, and the City would love to see activity in the area, afternoons, evenings, and on weekends. Rue: There are people doing this stuff already. People with their painting tripods, and folks taking pictures. There are a few art galleries, but to have something that is more active and has more community ownership, is strongly needed in Chinatown. Sidney Lynch, with Hawai‘i Potters Guild for 25 years, as president, now treasurer, says demand for classes is increasing, just as places to make art are decreasing in town. The Potters Guild workshop has been active under the freeway behind Church of the Crossroads since 1967, and they're interested in expanding some programs downtown. Sandy Pohl, owner of Louis Pohl Gallery on Bethel, runs art workshops through her Creative Arts Experience nonprofit. She’s the one who spent the last six years knocking on City doors to secure space for an art center for the downtown crowd, for after work and weekends. Pohl: People who come in here, they become my friends. Because It’s just kind of a cool place to hang out. That’s kind of what I want to create over there. Hawai'i Potters' Guild, located in the Varsity area, is also pitching in with the Downtown Arts Center. 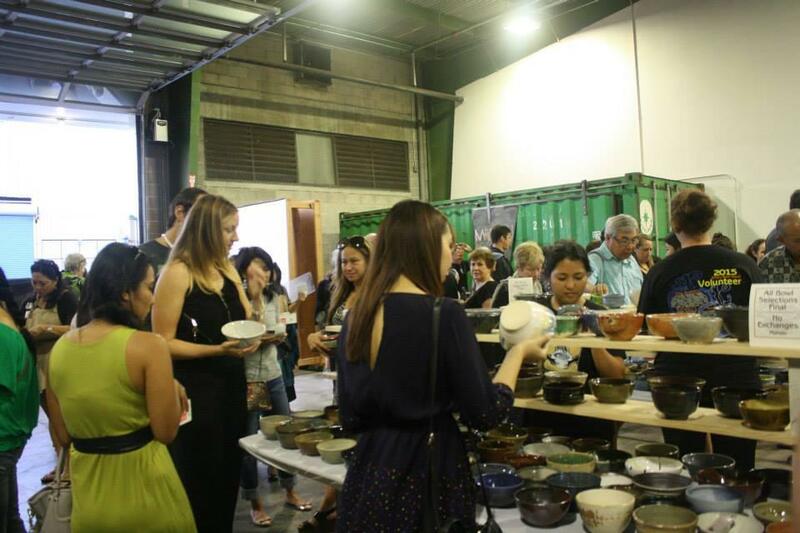 The venerable ceramics coop contributes every year to the Empty Bowl Project, one of Honolulu's best fundraisers. Donors get to pick a bowl, which then holds their dinner--what a deal! Over at the Downtown Art Center, that is. If anybody could make it welcoming, Sandy could. Pohl stresses that a nimble hui of artists and organizations will be able to take advantage of art opportunities, work together to leverage solutions, and serve as a nexus for sharing ideas and resources across the islands. Latest development: the Honolulu Printmakers have filed a request with the City for a 2800sf space on the second floor of Chinatown Gateway Plaza. They are interested in moving their presses and operations to a location where they can print, hold workshops, offer residencies, show work, and generally grow. Paul Weisman, treasurer of the Honolulu Printmakers, says the demand is there. The Printmakers have also submitted a proposal for a smaller space in the new Ola Ka Ilima Artspace development in Kaka‘ako. They're waiting to see what pans out. Meanwhile, there is also a 10,000sf space on the second floor of Chinatown Gateway Plaza that has been similarly vacant for ages. If enough groups throw in, Sandy Pohl has her eye on that space for the kinds of exhibits the Printmakers, Hawai‘i Craftsmen, Hawai‘i Woodworkers, Handweavers, and others have staged previously in the large gallery at the Honolulu Museum School. Executives and other office workers might choose to spend a couple of hours learning to weave, or make jewelry before jumping in the car to head home. Creative Art Experience, headquartered in the Louis Pohl Gallery, has been holding make-and-take events for years, experimenting with what people like to do. Alert! Honolulu Printmakers treasurer Paul Weisman says, This is the Moment. Weisman: It’s almost like, let’s canvas the art community, how much space do you really need? How much can you afford? Are you willing to take a period of time as an exhibit space and monitor it during that time? Neighbor islanders and huis are welcome! For example, Donkey Mill, please talk with East Hawai‘i Cultural Center and figure out how you can take one month here in Honolulu and please, please bring your Big Island artists here. Hold readings of Hawai'i island poets and writers in that time, bring your unreal lomilomi practitioners in and hold court there in downtown Honolulu, you may find some customers. Let Mark Yamanaka come here and your other great singers, Lorna Lim, please bring her to sing in that beautiful Gateway Plaza. Kohala, we want to hear your guitars in Honolulu! Maui, Kaua‘i, Moloka‘i, Lāna‘i, don’t get me started! American Savings Bank, beautiful new Chinatown neighbor, how about a strong partnership with this future resource for your employees? Heavy hitters, Hawai‘i Craftsmen and Honolulu Printmakers are already down, with Pohl’s Creative Art Experience. Weisman says this Saturday’s pop up is a demonstration of support and kick off for the two and a half month experiment. If you'd like to find out more, stop by Saturday, give Sandy Pohl a call at Louis Pohl Gallery 808-521-1812 or email her at creativeartshi8@gmail.com . Hands, hearts, and ideas welcome.